I am currently using Pythonista on an iPad and when ever I try to use multitask with Pythonista in picture in picture mode over another app, the input line in console is covered by the on screen keyboard keys. It works fine when I use it in split-view but only when it’s in the picture in picture mode it overlaps. 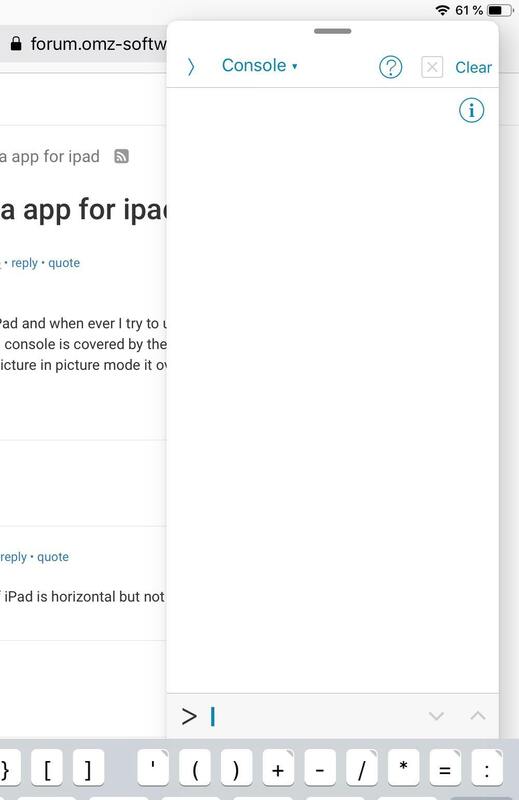 @ckim0717 I have the same problem I If iPad is horizontal but not if it is vertical! I see, it seems to be a problem in landscape only. Quite honestly, I use my iPad more in portrait mode than in landscape, and I hardly ever use the slide-over multitasking mode, so this is probably something I haven't tested very well. @omz will there be a fix soon?? @ckim0717 I‘ll look into it, probably. Try disabling "Shortcuts" in the iOS keyboard settings - this hides that toolbar. Have you tried calling the split keyboard on the iPad - press g & h together and pull apart, there must be a function to make it do this through coding but I’m not that good!!! More than likely one of our community members may know. @james_a_craig Thank you! I guess for now just getting rid of the shortcuts is the best way. Easy fix!